"I now realise that there have been a significant number of athletes and coaches in this sport who have cheated and taken the short cut, and many of them knew who else was cheating. But I will not give up on this sport and the current group of young athletes like Jeremy Wariner, Allyson Felix, Tyson Gay, Christine Ohuruogu, Usain Bolt and Asafa Powell. I will continue to support them but the difference is that now I can certainly understand why some fans may be hesitant to do so themselves. And I can't blame them for that. And that is a huge problem for the International Olympic Committee, the IAAF, and the whole track and field community. It is also a huge responsibility for the World Anti-Doping Agency, because many of the athletes who have now had to admit to using banned substances never tested positive." *Usain Bolt Says 100 is His Best Chance for Gold in Olympics Yet the 200 is his favorite race. *Usain Bolt: "I still think the 200m is my best race"
*Steve Cram Writes about Usain Bolt and Drugs We're surprised at how cynical everyone is with the record. We've been cynical about all records for a while, but still give the people the benefit of the doubt most of the time. Gay, Bolt Campbell, Williams Address the Media The highlight of the meet is the 100m showdown between Tyson Gay and Usain Bolt. The women's 100 has a great field (Veronica Campbell, Lauryn Williams, Allyson Felix). We include a preview of all the distance races which are led by a very strong men's 800 and we give you the letsrun.com predictions. There also is a great men's shot, Liu Xiang versus Terrence Trammell in the hurdles , Sanya Richards in the 400, and Jenn S in the pole vault. More Coverage, Highlights at the link above. Steeplechase World Record Holder Saif Saaeed Shaheen Defeated In 1st Race Since 2006. He ran 13:29 for 5k. Kenyan Prison Services Champs: Bernard Rotich Runs Fastest Ever 10k on Kenyan Soil The unheralded 22 year old is now a force as he clocked a 27:09 at altitude. Ridiculous. Especially considering his pr was 28:31.In the women's 5k, C. Ndereba was encouraged by form on road to marathon in Beijing. Tyson Gay/Asafa Powell To Battle At Paris Golden League meet on July 18. The sprint stars already had agree to square off in England on July 25. Pat Tyson Goes Full Circle: Becomes First Fulltime Coach in Gonzaga History From Mead (Spokane), To Ukentucky to Eugen to Spokane. Thread of the Week? High School 4x800m Boys record Given a Scare The thread was started to talk about North Penn's impressive 7:38.79 4*800 but turns into a historical gem with talk of the incredible 4*800 duel in 1965 between two local powerhouses Andrew Jackson and Boys HS in NY. They both ran 7:35.6 a national record that stood for 36 years (and still is the most impressive 4*800 mark on the books as the difference in the quality of the tracks is worth more than .07 seconds and that is how much their record was beaten by). There is a link to a NYTimes article on Julio Meade, the Jackson runner who Marc Bloom calls "the best runner I ever saw". Meade committed suicide outside a courthouse in 2001 after pleading builty to money laundering. If you have a historical race you think we should give publicity to, email us. Interesting Read: World Leader in the Steeplechase Donna MacFarlane Hadn't Run for 6 Years in 2005 When She Took Up Running Again Pretty incredible. From fitness runner to world leader. NYRR Head Mary Wittenberg Talks About Her Workouts with the WSJ The NYRR turns 50 this week. Dwain Chambers Being Invited to Lesser Meets in Europe . *German Fernandez, Jordan Hasay, & Chanelle Price what should they do? Jeremy Wariner threw the greatest 400m coach ever Clyde Hart to the curb over a contract dispute before the season and he might want to give Clyde a call now. LaShawn Merritt battled stride for stride with Wariner and defeated him in the 400 running 44.03. It was Wariner's first 400m loss in a race he finished since 2005. In the women's 800, Pamela Jelimo continued her amazing emergence. Earlier this week it was reported the Kenyan Federation wouldn't let her run in this meet, but she showed up anyway and put on an exhibition. 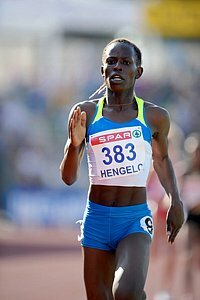 She absolutely destroyed the field that included the World Champ Janeth Jepkosgei. She's at a whole different level than everyone else in the world and the World Record looks like a real possibility. She went out in 56, 1:24. and held on to a 1:54.99. Sick. *LaShawn Merritt: "I won this one but the big show is in a couple of months"
Rock N Roll San Diego: Wangai, Gromova Win 11th Rock 'n' Roll Marathon and $35,000 Our apologies. Chicago champ Patrick Ivuti ran this race and dropped out (we thought he was running a Rock N Roll half-marathon). *Walter Dix Is Back - Wins 200m He was 3rd in the fast 100 which was won in 10.09 by Padgett into a wind. *Josh McDougal's College Career Comes To An End With A Whimper He's been battling an injury and didn't start the 5k as he wants to focus on the US trials. LRC US RANKINGS!!! What better time than an Olympic year to start what we hope will be a regular feature on the website. We give you our top 10 US rankings for the mid-d and distance events to help prepare you for the Trials as its virtually impossible for the casual fan to follow. Our rankings do not incorporate last night's Oregon meet. *Trevor Graham Guilty On 1 of 3 Counts If you're surprised, you shouldn't be. Unless you were surprised that he got off on two counts (jurors were 10-2 and 11-1 for conviction on those counts). We're not sure how the jury foreman got picked. This is what he said after the trial , "The government was bound and determined to make an example of this defendant," and chose to "do a deal with a true devil, an untruthful drug dealer and illegal immigrant. I hope this verdict satisfies the Justice Department's lust for blood and there is no retrial." *Read More About Crazed Jury Foreman Here We Hope They Retry Him Unfortunately due to the jury foreman, according to the Washington Post the govt. didn't convict Graham "on the two counts that went to the heart of whether Graham was involved in dealing performance-enhancing drugs to athletes." Idiotic. The juror wasn't sure if Graham lied when he said he'd never met Heredia even though there were photos of them together. Most Americans are Skipping Golden League but Jeremy Wariner Will Give it a Run Reebok and Berlin are this week, Oslo and Pre next week. Not the best schedule possible. Huge Article on HGH Precursors on Front Page of Sports in USAToday Just when you held out hope for an HGH test, athletes are on to new things. *In Depth Analysis by ESPN.com on U.S. Pro Sports Leagues, Olympic Drug Testing We said we thought this article gave the Olympic testing too high a score because there aren't tests for a lot of drugs and the article above on HGH supports our point. *Recap of Men's Race from Colorado Daily Jorge Torres had to back off the fast early pace and no one came back on him like last year. *Bad Elite Coverage in Boulder? ING Ottawa Marathon: David Cheruiyot Gets Hat Trick at ING Ottawa Marathon, Drug Cheat Asmae Leghazoui Wins Cheruiyot got the win in his Spira shoes. And remember how USATF said Spira shoes weren't banned? Then how do they explain this letter that says USATF can not support athletes affiliated with apparel "that does not in (sic) comply with IAAF and USATF rules". We never though we'd see the day when Spira, not USATF, has our sympathy, but it's here. This is very simple. Either ban the shoes, or don't, but don't talk out of both sides of your mouth. *Christine Babcock Runs 4:36 1,600 The Washington bound senior runs one of the fastest 1,600s in history. *Message Board Thread on Babcock's 4:36 Here. *German Fernandez ran a ridiculous 4:07/8:45 double that one college coach said looked "like a walk in the park"
LRC Stanford: Shalane Flanagan, Kim Smith Put On a Show, Flanagan Smashes American Record (30:34.49)!!! *Results Shalane Flanagan and Kim Smith put on a show for 25 laps on Sunday night and in the final 200 Flanagan came out on top smashing the American record (30:34). 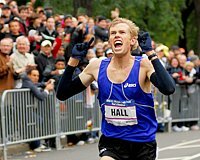 Smith had to settle for a Kiwi record (30:35). Other highlights included Bernard Lagat running a 56 second last lap to win the men's 5000m (13:16.29) and being followed by Colorado senior Brent Vaughn in a stunning school record 13:18.46; Craig Mottram blowing away the field to win the men's 10,000m (27:34.48) as DII American star Scott Bauhs hit the Olympic "A" standard. The men's mid-d races were somewhat of a letdown as no Olympic "A" standards were hit in the two "equal" 1500m sections. (Although Kevin Sullivan continued to do what he was doing when Nick Symmonds was eight years old and new miling sensation Andrew Wheating did win the men's 800). Shannon Rowbury dominated the women's 1500 and showed she is a fast emerging American star. 10k Weekend Action We Didn't Report: Fasil Bizuneh Runs 27:55 Just Misses Olympic "A" Standard Again If the report below is accurate Fasil ran 13:50 the 2nd half of the race. *Former NCAA XC Champ Simon Bairu Comes Up Short in Attempt to Make Olympics The overall premise of the article is idiotic that Bairu missed out because he ran a lap short, but it does have a few useful nuggets of info. Shorts, Singlets $6.95 Going out of business sale.